Yamaha YZF-R1. "Yamaha is challenging the future." It was with this emphatic phrase Hiroyuki Yanagi, President and CEO of Global Yamaha introduced the new-generation YZF-R1 superesportiva during the Milan Motorcycle Show 2014. And the excitement was not for less. 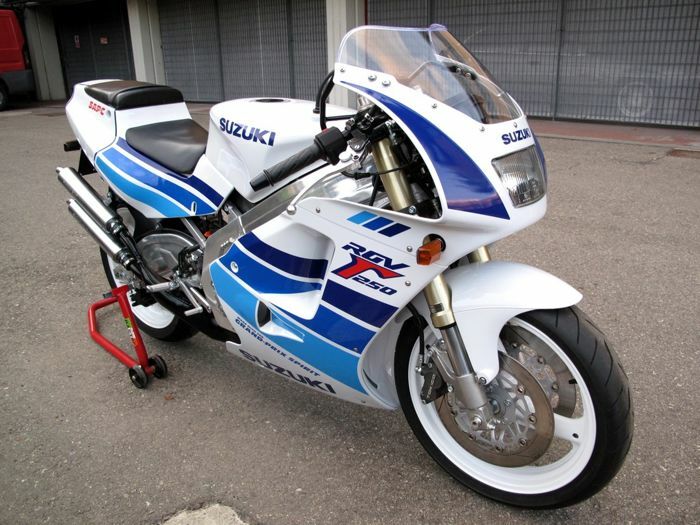 In its 17 years of existence, the R1 has changed a few times, yes, but nothing as radical as this R1 2015. The model, which now comes to European and North American markets, totally renovated on the outside and modern as ever inside, to show that, more and more power, technology and style go hand in hand. In design, the YZF-R1 abandoned for the first time the visual created almost two decades ago, characterized by large double optical assembly. So many changes in the bike's appearance is explained by the orientation of the project. 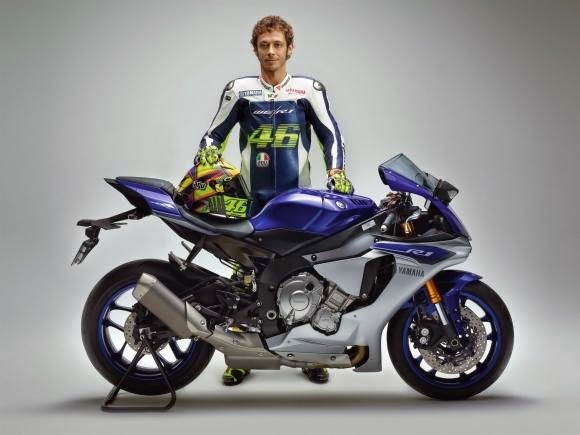 According to Yamaha, to develop the new R1, the team was encouraged to create a fresh superesportiva, not only plan changes to update the bike that already existed. And that's what happened. The lines now are inherited directly from the YZR-M1 prototype racing in MotoGP, and left the superbike with futuristic look. Proposal strengthened both by lateral cuts fairing, as in discrete LED lights that make the day-lighting and become encrusted on the front. The main lighting is now made by two light guns above the front wheel. The tail light received over lines composed of two hollow panels that converge in a central structure. This is home to the flashlight, a vertical strip in LED. The subframe design was more streamlined now that he no longer carries the two exhausts. Just as happened in its first generation, R1 reverts to its four cylinders converging on a pole on the right. The exhaust has polygonal design and is well positioned close to the bike, not to disrupt the body roll in corners. The YZF-R1 has not changed just out. Yamaha developed a new more compact engine and be able to offer more power and less weight. Thus, the new four-cylinder in-line water cooling and 998 cm³ capacity is more compact and composed of several parts made of carbon and titanium. A new crossplane crankshaft was also incorporated. The axis continues activating the pistons with 90 intervals and now offers more linearly torque to the pilot more enjoy the performance that the superbike offers. Other changes were made to optimize the mixing of air with the fuel, creating a compression ratio of 13: 0: 1. The result is 200 hp of maximum power at 13,500 rpm and achieved without the aid of any pressurized air induction system (RAM-Air), which is crimped by Yamaha. But the torque is 11.5 kgf.m the 11,500 spins. The bike also features tank capacity of 17 liters and exchange six-speed with slip clutch. The set is electronically assisted by Quickshift system. (QSS). The aid consists of a sensor positioned on the shift lever, which senses when the pilot is climbing gears and sends the information to the ECU. This, in turn, cuts the tension in the engaged gear for a smoother change. One of the main features of the R1 is a good relationship between weight and power, improved feature in the new generation, which has a weight of 199 kg in running order. According to the brand of the three tuning forks, this was achieved by redesigning the aluminum Deltabox frame asymmetrically and reempregando one new subframe made of magnesium. In the item suspension, both the inverted front fork as the scales are linked monocushioned stroke of 120 mm. To hold its 200 hp, the bike has two front discs 320 mm in diameter and a 220 on the back. Here the news is the ABS assistance with unified braking system, which electronically distributes the force on two wheels. The new YZF-R1 is also shorter and narrower. The length increased from 2.070 mm to 2.055 mm, while the width was reduced from 715 mm to 690 mm. Although it is in numbers, the changes are emphasized by the compact design of the bike. The height of the seat, however, increased by 20 mm and the driver is accommodated now 855 mm from the ground. The electronic menu embedded in R1 is one of the most complete today, if not the largest. 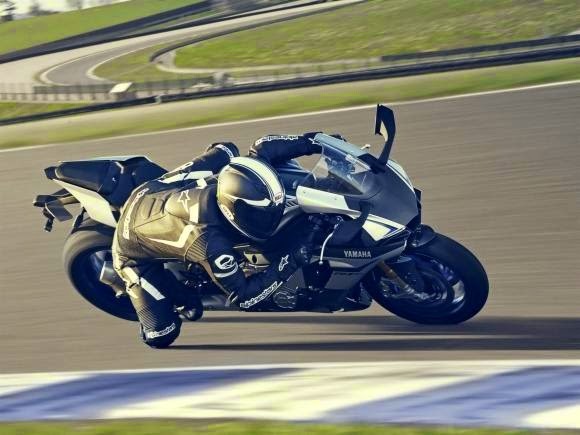 The bike is equipped with four power delivery modes, traction control (TCS) adjustable in nine levels, control wheeling (LIF), adjustable to three; and start (LCS), which reduces the rotation of the motor below 10,000 rpm's time to get on the bike, even the pilot turning the most of the accelerator. In addition to the unified ABS brakes and the electronically assisted exchange (QSS). There are also four riding modes (YRC), which put all the controls on pre-set parameters to facilitate the pilot's life. To control this, the Electronic Central Unit (ECU) is no longer focused on "simple" tasks such as controlling the operation of the fuel injection and the opening of the valves, for example, to act as a true electronic brain of the bike. The ECU now makes decisions based on the data sent by another acronym: IMU, Unit Electronic Measuring in English. With power of 32-bit processing (same as a PlayStation 1 game, to get an idea), the unit constantly monitors the position and the bike's behavior. Thus the electronic systems can be adjusted to optimize performance, but without forgetting the pilot's safety. According to Yamaha, the IMU provides a motorcycle 3D panorama, since the readings are taken in six axes, which correspond to the positions that it may be: inclined to the right, left, upward (wheeling) to low (end of the fork travel in a braking), with the acceleration and speed reduction. All this means that each time the pilot chooses a setting, by means of levers and the new all-digital panel, the bike will take into account the measurements of the IMU to execute it in the best way. Traction control, for example, will not only stick to the rear wheel of loss of adhesion to act, it will also act on the bike angle. And so on. Available in Europe and the United States, in blue and red colors, the bike part of US $ 16,490 in the US market. 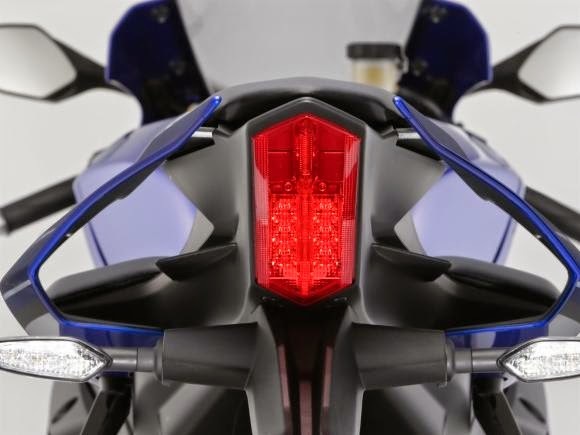 More electronics, more exclusive and more an "M"
To show how the new generation R1 is important to Yamaha, the brand of the three tuning forks did not leave for less and also released a limited edition of superesportiva. 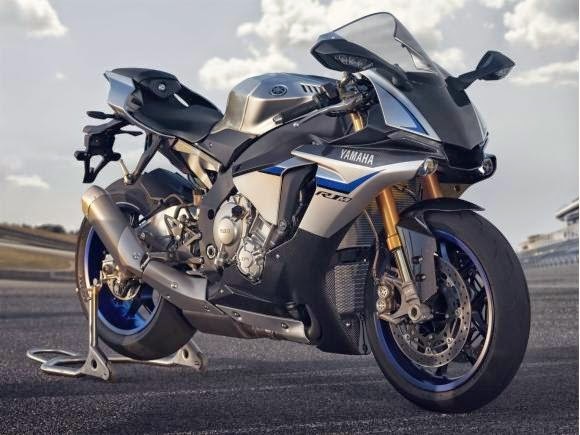 Called R1m, in clear reference to the model of MotoGP, the superbike comes in silver color and brings items focused on performance in track, as several parts in carbon fiber. The bike also brings more technology to the already extensive package. In addition to the set of Öhlins suspension, which can be adjusted electronically, the bike still brings Communication and Control Unit (CCU) installed in the tail. The system works with a GPS and communicates with an application for Android. 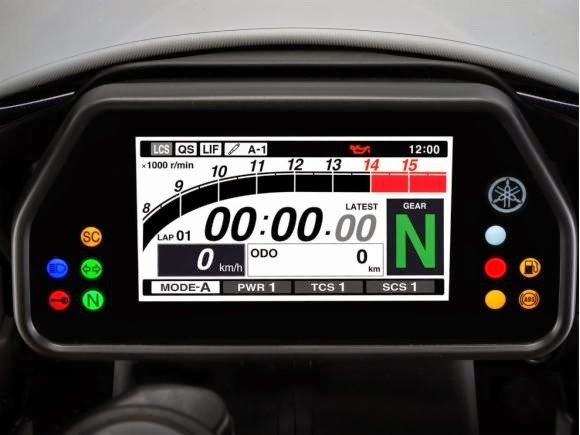 The "app" stores the driving data such as lap time and inclination angle and still allows the pilot to make changes to the electronic controls of the bike the distance. 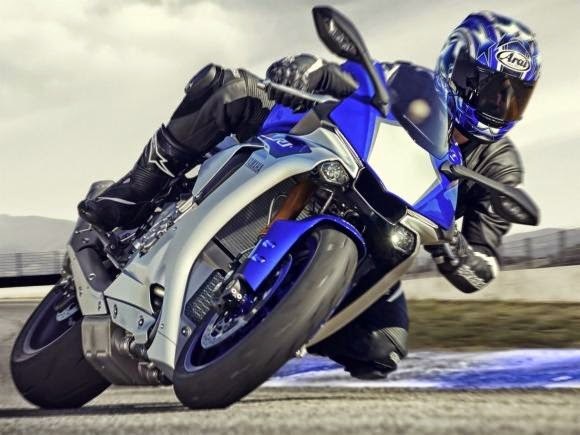 All this of course has a cost, in which case the YZF-R1m is US $ 21,990.